NETWORK FINALS: AMERICA’S GOT TALENT gained 0.1 in final numbers, while the LOVE CONNECTION rerun lost the same. CABLE HIGHLIGHTS: USA’s WWE SMACKDOWN led Tuesday cable, down 0.02 to 0.75, with MIZ & MRS down 0.08 to 0.42, and CHRISLEY KNOWS BEST down 0.03 to 0.31. On Bravo, BELOW DECK was steady at 0.50, and MILLION DOLLAR LISTING ticked up to 0.23. On MTV, THE CHALLENGE dropped 0.06 to 0.47. On Discovery, DEADLIEST CATCH gained 0.03 to 0.44 (the lead-in hour was up 0.05 to 0.25), and HARD TO KILL was down 0.02 to 0.14. On OWN, THE HAVES AND HAVE NOTS held at 0.42, and the lead-out season premiere of GREENLEAF was at 0.38 (down 0.08 from 2017, but that was following a 0.64 lead-in from HAVES AND HAVE NOTS). On TLC, OUTDAUGHTERED ticked down to 0.36, and RATTLED was down 0.04 to 0.17. On History, FORGED IN FIRE remained at 0.34, and COUNTING CARS was at 0.26/0.26, compared to last week’s 0.25/0.25. HBO’s HARD KNOCKS stayed at 0.32. The season premiere of Paramount’s INK MASTER was at 0.31. MSNBC’s RACHEL MADDOW SHOW led cable news on a primary night at 0.30/0.46/2.9M, with Fox News’s HANNITY at 0.27/0.53/3.4M, and CNN TONIGHT at 0.25/0.35/1.1M. TBS’s WRECKED fell 0.07 to 0.29. 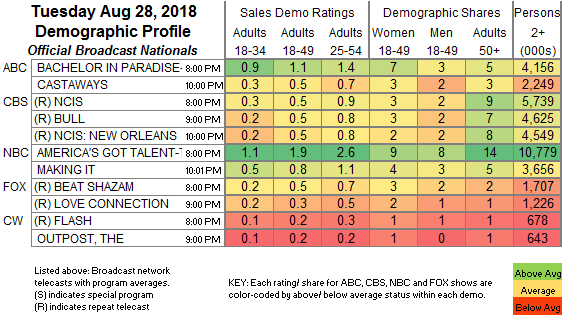 On Lifetime, MARRIED AT FIRST SIGHT lost 0.05 to 0.28, and SEVEN YEAR SWITCH ticked down to 0.13. Food Network’s CHOPPED GRILL MASTERS gained 0.03 to 0.27, and CHOPPED was down 0.03 to 0.18. On ID, THE DEVIL SPEAKS fell 0.07 to 0.27, and MURDER BY NUMBERS was down 0.02 to 0.26. On HGTV, DESERT FLIPPERS climbed 0.03 to 0.26, HOUSE HUNTERS was at 0.24, and HOUSE HUNTERS INTL was down 0.08 to 0.21. The season finale of TV Land’s YOUNGER was at 0.22, steady with last week and down 0.07 from 2017. On Comedy Central, ROAST BATTLE gained 0.07 to 0.18, and THE JIM JEFFERIES SHOW was up 0.03 to 0.12. 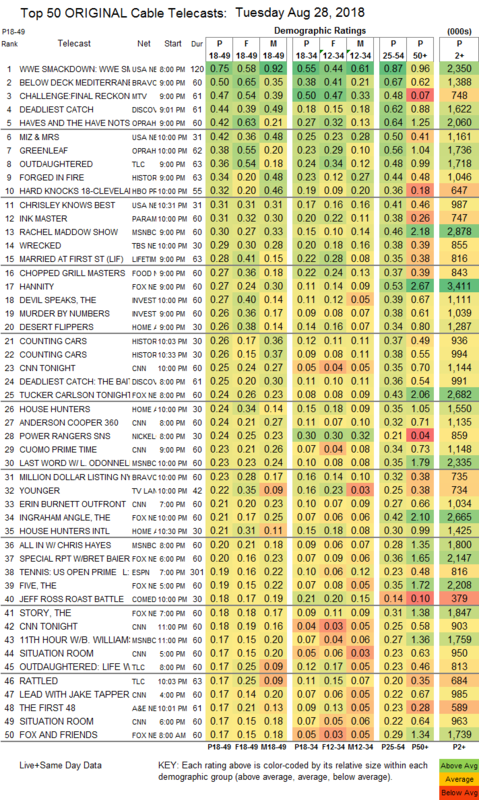 A&E’s THE FIRST 48 was at 0.17, compared to last week’s 0.20/0.19. BET’s HIT THE FLOOR lost 0.04 to 0.12.